Always check that your headlights are working: The law in Arizona states that you must have your headlights on any time after dusk and before dawn. Even if you think that it’s bright enough for you to see clearly, taking extra precaution by making the effort to turn your headlights on will help in more than one way. First, it could potentially deter an accident, as other drivers on the road will be able to easily spot you and your vehicle behind, ahead, and to the sides of them. Additionally, turning your headlights on at the appropriate times will help to avoid a traffic violation ticket. Turn on your fog lights if necessary: Even if you have properly working headlights, they might not be bright enough for you to feel comfortable while driving in the dark. If this is the case, we suggest that you turn your fog lights on, rather than using your bright lights or continuing to drive while slightly uncomfortable. Unlike bright lights, it is completely legal and acceptable to have your fog lights on if you find yourself needing additional lights while driving home. Don’t forget to drive the speed limit: For whatever reason, it feels like the car can sometimes seem like it’s going faster, even when you’re driving the designated speed limit. 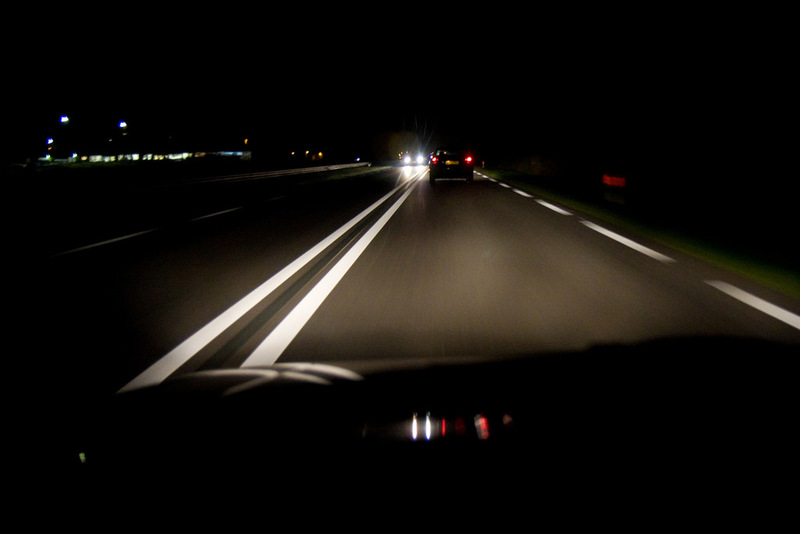 While you should never be driving over the speed limit, you can always drive in the furthermost right lane while at night, and even drive five miles below the speed limit if it helps you feel more comfortable.